the bush and drivers on logging trucks. Olofsfors Eco-Tracks allows it to more easily tackle skidding in the District’s Tree Farm Licence 26.
specialists Dennis and Brian Hoobanoff are praising the productivity of their new purpose-built Tigercat LX830C tilter feller buncher, which anchors the company’s logging equipment fleet. The town of Midway, B.C. has teamed up with sawmilling savvy Vaagen Bros. to re-start an idled mill in the town, working on a very tight $8 million budget—but with lots of enthusiasm. LSJ talks with Conifex CEO Ken Shields to get some insight on the reasons why he chose to set up a new forest company in the midst of an industry downturn, what they’ve done to improve operations at their two mills—and what improvements are still to come. 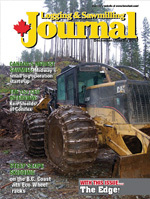 From doing your pre-trip to figuring out how to manage the weather, Logging and Sawmilling Journal has some solid tips on how log haulers can best deal with winter weather. Included in The Edge, Canada’s leading publication on research in the forest industry, are stories on Canadian Wood Fibre Centre /Natural Resources Canada, Alberta Innovates - Bio Solutions and FPInnovations research projects. B.C.’s Bruce Andrews had an intriguing start to being a sawmiller—he traded a boat for a Wood-Mizer mill—but his export driven cedar business has steadily grown, to the point that he is now looking at installing some lumber drying equipment. Jim Stirling talks about how the downturn has claimed a number of sawmills, but there are some feisty independent sawmillers in B.C. who are still standing. 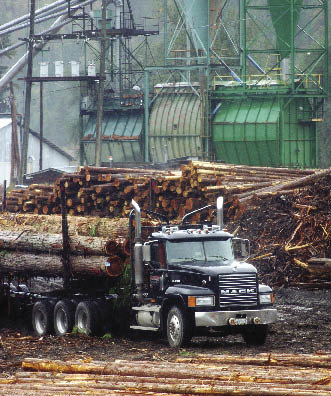 B.C.’s Central Interior Logging Association has launched a training and job placement initiative that will help meet a shortage of operators in the bush and drivers on logging trucks. Where is the much-needed next wave of forest industry workers coming from and how will they receive the training necessary to become industry ready? 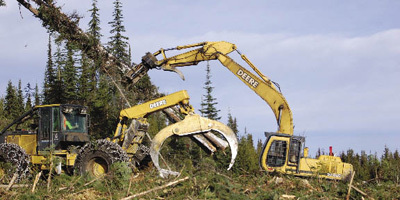 The Central Interior Logging Association (CILA) and its partners have been working on supplying an answer to that question with an expansive and focused training and job placement initiative scheduled to gather momentum through 2012. The move is nothing if not timely. The pool of experienced forest machine operators and logging truck drivers has markedly evaporated. The situation has deteriorated to the point where equipment has been parked and log inventories piled at various times around British Columbia because of the skilled operator shortages. Several factors have converged to create the crisis. They include an aging work force, the forest industry slowdown/uncertainty and operators migrating to higher paid jobs with more regular hours in other resource industries. Contractors have said it can cost $50,000 to $60,000 to nurture a new recruit into production mode on some log harvesting equipment, points out MaryAnne Arcand, the CILA’s executive director, member services in Prince George. And, of course, there’s no guarantee a new fully trained worker is going to stick around. A key ingredient in the new training and job placement thrust is to remove some of the headaches and financial burden borne by contractors. And a way to do that, suggests Arcand, is complementing the training with ongoing screening and evaluation procedures designed to match the right student to the right job. The CILA will work with accredited machine and truck driving training centres around B.C. and assist with sourcing student funding. This funding could be from any number of places including forest industry licencees and EI. The provincial government through its Labour Market Solutions programs is also a key partner in the CILA’s training and job placement strategies. The training school steers the students to whatever the applicable employment standard requires; there are several connected with B.C.’s industrial skills. They also evaluate each student on competency, attitude, aptitude and identify any further training requirements. The CILA reviews each student’s evaluation from the training school. The pre-job placement profiling and interviewing process then kicks into higher gear. The goal is to find the best fit from lists of employers, their requirements and working conditions. The CILA also plans on providing coaching and support for job placements. The employer pays a finder’s fee and contributes to the coaching/support services provided based on an hourly rate. For a specified period, the new student will be under a three strikes and you’re out regime. For example, if a student doesn’t show up for work without informing the employer, that’s one strike. Arcand says the CILA’s training and job placement approach has received wide interest from a variety of resource and transportation sectors. However, there will also be a specific module geared to forest industry bush operations. An inexperienced or careless worker can cause much more potential mayhem in short order working in the bush, notes Arcand. Also, statistics reveal most injuries occur to workers who have less than six weeks on the job. Several upgrades to basic training are required for safe bush work. They include everything from specific skills training and lock out and safety procedures to understanding a loaderman’s signals. The bush module will also include basic machine maintenance that’s part of the operator’s job. This includes greasing, hydraulic hose replacement and a rudimentary troubleshooting analysis capability. Even then, there’ll be much to learn for the new worker. Each contractor company has its own preferred operating procedures, practices and radio calls. “My goal is to have the new student at 40 per cent of production rate,” states Arcand. So, where are these students to come from? Most industries are facing the same skilled labour crunch and competition for suitable candidates is keen and destined to become more acute. “We’re looking to Ontario and Quebec, where some forestry is declining and to Washington and Oregon where raw log exports are down and we’re looking overseas,” she says. First nations, women and young people in urban centres who might be attracted by a more affordable life style are also being targeted. They’re also looking at upgrading workers currently in the industry and those who might be underemployed in other sectors, adds Arcand.